Using the R+G House as a precedent, and using another version of the 'Colorpanel' standard steel shed frame system with 26˚ roof pitch, this 108sq.m, 3 bedroom house plus 39q.m shed garage, was designed to be built at that time for AUS$ 105,000. The given site area was 600q.m. 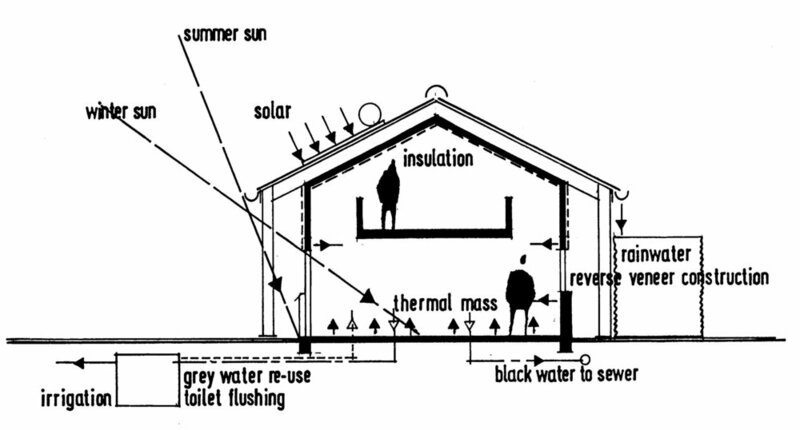 The agenda was to try also and achieve thermal comfort and low energy demand through good solar design, ventilation, insulation, thermal mass including masonry internal walls, with the double roof principal as used in the Four Horizons House and the R+G House. The location was nominated as a sub-urban rural Australian town, and the shed character was suggested as appropriate. Other strategies included rainwater collection, solar water heating, grey water recycling to a garden and for car washing. The objective was to produce a house as an alternative to the black roofed, single storey box that occupied the nearly all the land available and needed air conditioning to make it habitable. It was, of course, exactly what the public do not want.